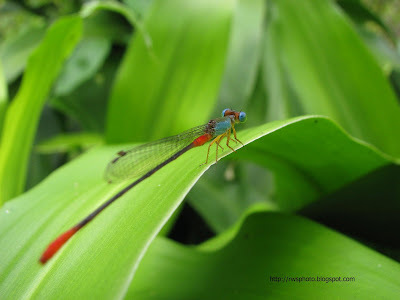 Photo of a tiny red cyan tropical Damselfly. If I'm not mistaken, the Damselfly species is probably a Ceriagrion Cerinorubellum. Click image for larger display. That is an exceptionally beautiful damselfly. I've added you to my "Nature & Conservation" blogroll. I hope you'll consider linking to my blog, Beetles In The Bush.